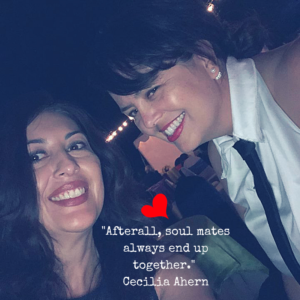 Her comment made me question if I indeed believed this to be true, “Are there really soul mates?” It challenged my beliefs. I also wondered where her comment was coming from, was it a displaced and hurt heart for someone she thought was her soul mate? 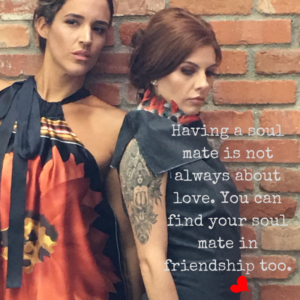 I started to analyze and question, “What is a soul mate?” So, I started with the basic definition–a person ideally suited to another as a close friend or romantic partner. I have always believed that a soul mate is someone who is deeply woven into your being. It is not always romantic. I can be a person that you don’t see every day. They may cross your path, leave, and you find your way back to them. Your soul mate is someone you feel entirely comfortable sharing your most intimate details without fear of judgement. I was in Rihanna’s video, We Found Love, and more specifically, it was the prologue dialog guiding me. I don’t see where, but I followed the voice echoing in the dark. It’s like your screaming and no one can hear. You almost feel ashamed that someone could be that important that without them you feel like nothing. No one will understand how much it hurts. You feel hopeless like nothing can save you, and when it’s over and it’s gone, you almost wish you could have all that bad stuff back, so you could have the good. As I wander, really letting the words sink in, waiting for the lighting to strike and thunder roll, as in the video, I feel my body shaking. Begrudgingly, trying to wake from this dream, I raise my left arm over my head and stretch. I move my hands to my eyes to wipe the sleep out of them, when I hear a familiar voice call to me, “Sophia”. I open my eyes to see the figure move to the edge of my bed. I pull myself up to see Annie in my room. “Annie, what are you doing here?” I ask. “I came to say good-bye. It’s time for me to go,” she states matter-of-factly. “It was important for me to let you know.” At that moment, I feel like a child not understanding what was happening before me. Annie walked over to the head of the bed, and as I looked at her she gently kissed my forehead and a phone rang out. The whole scene dissolved. I felt like I was in a different universe and couldn’t grasp what was happening before me. The phone rang out again and I woke with a jolt. I had been dreaming. I looked at the clock and it was 5:30am. Instantly, I knew something was wrong and immediately answered the phone. He whispered, “Ok. Safe travels.” I ended the call and threw my phone on the bed. Sitting on the edge of the bed I put my head my hands and was overcome by emotion. Huge convulsing sobs controlled my body and as I tried reign in the grief and pull myself together. I was taken back to my dream. I originally sent this first part to a friend who’s also a writer/editor. He challenged me for more, so I sent this, which is my bizarre love triangle—one may think is the romantic love cluster, but instead what I found was that the true connection of love is found in the genuineness of soul. I remember reading a quote one time that said, “If you meet somebody and your heart pounds, your hands shake, your knees go weak, that’s not the one. When you meet your ‘soul mate’ you’ll feel calm. No anxiety. No agitation.” Which is contradictory to everything I’ve ever learned about love. I couldn’t breathe, but I couldn’t stop either, “Annie, would only speak about you in passing, but I couldn’t bring myself to ask about you and I didn’t want to find out that you didn’t ask about me.” I was numb and I couldn’t look at him. I felt like I verbally assaulted him and that wasn’t my intent, but I also had to finally let out what I had been carrying for the past 5 years. I felt like time had stopped. There was no sound. I reached out for my glass and took a slow drink of the cool liquid inside. Paying attention to my movement, feeling like I was in the Twilight Zone, I put the glass down slowly. I swallowed and looked up and once again saw his tortured soul through his dark gaze. I half-smiled and looked down again. The silence was agonizing. I took another deep breath and pulled myself up. I couldn’t go through this again, so I made my escape, “I didn’t mean to lay this on you, however I needed to let you know what I have been carrying around for so long. The time you were in my life was unbelievable. Unbelievably wonderful—up until meeting you, I never had anyone support me and cheer me the way you did. I ate up every word you said. Your words made me work harder and stronger, so thank you for that. When I realized we were no longer in that good place, my heart broke into a million pieces but that also made me stronger. You brought the most incredible human into my life and I’d go through that hurt and pain then and now, because of it. Thank you for sharing Annie with me.” Not being able to read his emotions, I continued, “I know I’ve already taken too much of your time, so I’ll excuse myself now before making a bigger fool of myself.” I sat up from my chair turning to leave when he put his hand on my arm. “So you get to do all the talking and I have no chance to respond?” he replied. I wanted to scream, “NO, you’ve hurt me enough. I can’t return to this space.” Instead I remained silent trying to catch my breath and emotionally remove myself from the conversation. In the past week and a half since I’ve received the initial text message and because I’ve been on my death bed with a form of the Bubonic Plague (not really, it just feels like it—I also have a flair for the dramatics), I’ve spent some time reading and viewing different perspectives on the aspect of who is ideally suited for you. I re-watched two movies that I think portray this beautifully: Life is Beautiful and Fried Green Tomatoes. Have you seen them? The former is an Oscar winning, Italian comedy about the holocaust. Yes, I understand how those don’t go together, but that’s the description found within the trailer. It is a beautiful love story about two people that who, society would say “shouldn’t have been together”, yet were drawn to each other and became inseparable. While I won’t give the movie away, because I highly suggest you watch it if you haven’t (you will smile through the tears), the way the main characters deep love for each other plays out when faced with life’s uncertainty or in the extreme example in this movie, death, is at the heart of what I believe a soul mate is. Watching, you can’t help but ask yourself, “would you stay or walk away? What would you be willing to do to save those you love?” I think we all say we’d act in the same way, but until tested we never know. I’m not jaded, but I’ve lived life enough to know this isn’t always the case. AND I think if you remove the “physically attracted” from the definition then it applies across the board. There are people that impact your life and vice versa that can only be understood as something that just cannot be described. I’d edit the other points that I somewhat agree with to the following: being in each other’s presence washes away your stress, worries, and anxiety; you understand each other’s pain and you empathize; and finally, while your souls meet at the right time, they may need time away from each other before crossing again to fully understand that they are indeed soul mates.